7/3/11 – Publication – Caen, Musée des Beaux-Arts – As always very active, this museum in Normandy, with the help of the Société des Amis, has just published, with Somogy as co-editor, a new annual journal highlighting its collections and related news called Cahiers du Musée des Beaux-Arts de Caen. The first issue offers a rich selection of articles on recent acquisitions : Mary Magdalene at the Tomb by Pietro Faccini (see news item of 10/3/10) and the Virgin with Child by Giovanni Antonio Sogliani (see news item of 26/5/09) which is in fact not really an acquisition but a deposit, which we hope will be permanent, placed by the town of Langrune-sur-Mer. This last essay is by Chris Fischer, a specialist on Florentine painting. Two articles feature works held in the collections : one, by Christophe Marcheteau de Quinçay, is a study on The Fall of Simon the Wizard by Valerio Castello ; the other, by Alexandra Bosc, catalogs the ensemble of sixty-four miniature portraits which will soon be exhibited in one of the museum rooms. In another article, with the amusing title of Les fantômes du musée, which appears to inaugurate a series, Christophe Marcheteau de Quinçay looks more closely at a polyptich on the work of Victor Hugo, by Jean Lecomte du Nouÿ, which was destroyed by the museum fire in 1944. 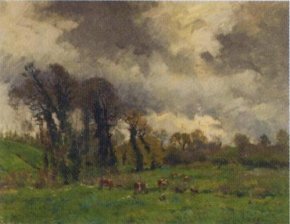 Louis-Edouard Garrido, Normandy Landscape with Cows. 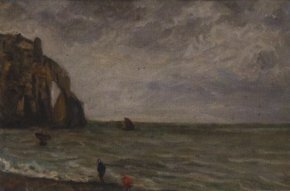 Donated by Mme Micheline Jeanne in 2005 (ill. 2). 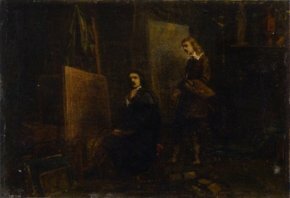 Frédéric Legrip, Le Sueur in Poussin’s Workshop. Donated by M. Christian Adrien in 2007 (ill. 3).